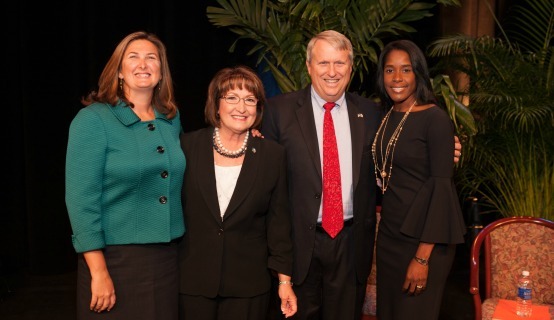 The Oath of Office ceremony was held for the second terms of Orange County Mayor Teresa Jacobs and District 4 Commissioner Jennifer Thompson; additionally District 2 Commissioner Bryan Nelson and District 6 Commissioner Victoria P. Siplin were sworn in for their first terms at the Orange County Convention Center on Tuesday morning. The ceremony, held at the Linda W. Chapin Theater, was attended by more than 400 citizens and televised live by Orange TV. In special recognition of renewed citizen participation and engagement, Girl Scout Troop 967 led the Pledge of Allegiance at the ceremony. Troop 967 mailed a letter to Mayor Jacobs in late 2012 explaining the need for a new traffic signal. Their request prompted county officials to study the intersection near the school. After a traffic study was conducted, which included a review of traffic counts and crash data at the intersection, County officials found the study justified the need and recommended that a new traffic signal should be installed near the school’s intersection. Fred Kittinger, Associate Vice President of University Relations at the University of Central Florida, served as the ceremony’s emcee. The talented Evans High School Trojans Choir sang the national anthem, as well as pre-ceremony hymns. The Invocation was provided by Rev. Ana Velez from Christ Hispanic United Methodist Church, and the Presentation of Colors was offered by Orange County Fire Rescue Honor Guard. A collection of photos from the Oath of Office are available on Flickr for use by the media.